Purad production in the new facility is ISO Class Five-compliant from start to finish. 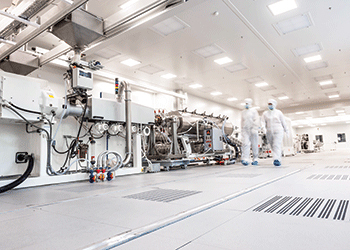 Agru has set a new benchmark with the opening of its Purad cleanroom factory plant in Austria. Through its regional agent BMC Gulf, the company aims to offer super-clean piping systems to the GCC. 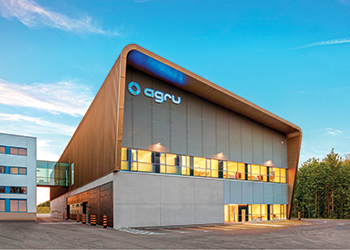 A signature facility for the production of piping systems for ultra-pure media has been opened in Austria by leading global pipes manufacturer Agru, setting new benchmarks in cleanroom manufacturing facilities. The state-of-the-art facility for producing Purad PVDF UHP (polyvinylidene fluoride-ultra high purity) piping components, the piping system for ultra-pure media, aims to meet the worldwide growing demand for piping systems for high-purity applications. It was built at a cost of €15 million ($16.7 million) and was opened recently after a year and a half of construction. According to the UAE-based BMC Gulf, which represents the Austria-based Agru, the Purad cleanroom factory plant is an absolute benchmark in the high purity piping system field. The new facility will ensure that BMC Gulf can cater to the growing requirements for super-clean piping systems particularly for clean rooms and high-purity applications in the region, says Fabian Beermann, division manager of BMC Gulf. Agru is one of the world’s most important single-source suppliers for piping systems made of environmentally compatible materials like polyethylene (PE) and polypropylene (PP), semi-finished products (also from fluoropolymers), and concrete protection and lining systems. It manufactures precision-moulded fittings for plastic pipes and the portfolio includes everything from semi-finished products through to the liner membranes. Purad piping systems for ultra-pure media are used for high-tech applications in the semiconductor, life-sciences, dairies, petrochemical and photovoltaic industries. “Uncompromising quality, outstanding customer benefit and high operational dependability are the characteristics of Purad. Whenever excellent anti-leaching properties and high chemicals resistance are essential, Purad is the first choice,” says a spokesman for Agru. Requirements differ from application to application, so Purad products are manufactured from different thermoplastic polymers selected for their specific advantages. PVDF UHP is ideal for the ‘transport of ultra-pure-refined media’ high-end application. Purad pipes in PP-Pure and Polypure are the best alternative for the transport of all other highly purified media. Plant Five, the new facility, is used exclusively for the manufacture of PVDF UHP piping components for the high-purity applications of customers from all over the world. Unlike many other plastics, this extremely pure polymer contains no stabilisers, plasticisers, friction-reducing or flame-retarding additives. The most common application is transporting ultra-pure water in the semiconductor industry. In chip production, a particle only a fraction of a micrometre in size can disrupt the structuring of the ICs (integrated circuits). The Plant Five building was planned by architect team ‘x architekten’ from Linz, Austria, and its characteristic features are functionality and ground-breaking design. Resembling a vastly oversized pipe, the bronze-anodised trapezoidal sheet-metal façade stretches across the entire complex. The interior carries on the modern, functional and clear architectural style, reminiscent of the cleanness and the surface quality of the Purad products manufactured in this plant. In all, Plant Five has a usable surface area of 7,739 sq m, of which about 60 per cent is taken up with materials storage and infrastructure. The cleanroom facility employs sophisticated hygiene concepts to ensures products are made to an ultra-high standard of cleanness. A sophisticated cleanness concept in Plant Five ensures that all pipes, fittings, valves, seals and flanges are produced to an ultra-high standard of cleanness and are hermetically packaged and double-sealed ready for dispatch from the facility. 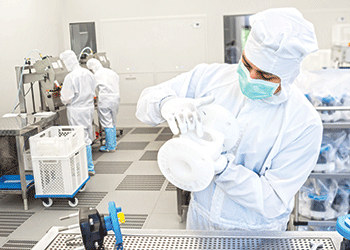 Purad production in the new facility is ISO Class Five-compliant from start to finish. So the facility meets hygiene requirements higher than those for hospital operating rooms. The design of the cleanrooms reduces concentrations of airborne particles that can settle on the products to super-minimised counts. Suspended-particle filters, protective clothing and a constant excess interior pressure prevent particles from making their way into or occurring inside the cleanroom. Access to the cleanroom itself is possibly only through personnel and materials airlocks, and protective clothing must be worn. Powerful airflows inside the airlocks cause entrapped particles to swirl free, so that they can be extracted into a filter to prevent the ingress of foreign matter from outside. The Agru specialists cleared to work inside the cleanroom wear protective oversuits, masks, gloves and overshoes to protect the products from contamination. Purad fittings, valves and flanges are manufactured by Agru on specially designed injection-moulding machines in three-shift operation in highly sophisticated processes using state-of-the-art injection-moulding techniques. The installed capacity in extrusion and injection moulding corresponds to an increase of about 30 per cent over the company’s former cleanroom production capability. The raw material, PVDF UHP granulate, is stored in a dedicated storage facility in the new production plant. As in finished-goods storage, here too the incoming inspections are stringent and removal from stock is strictly in accordance with the first-in first-out (Fifo) principle. Final cleaning and packing of the injection mouldings take place in the same building. And to make sure that customers receive a truly perfect product, all system components undergo more quality checks, according to the spokesman. “In exhaustive test routines that include dimensional checks and internal-pressure creep-rupture tests with hot water at 95 deg C and leak tests of the double hermetically sealed packaging, our products are tested under conditions vastly harsher than those encountered in real-world operation. These huge safety margins allow Agru users to rely 100 per cent on the quality, operational dependability, reliability and durability of our products. Naturally, in the course of continuous cleanness validation, surface quality and cleanness of all Purad products are checked visually and assessed by arrays of sensors,” says Thomas Narbeshuber, head of quality management at Agru. For a standard of cleanness unparalleled elsewhere in the industry, Agru has also invested in a new ultrasonic washing facility, says the spokesman. Before being packaged, the ultra-clean Purad components are washed with ultra-pure water and special tensides at a temperature of 70 deg C.
The Purad piping systems are stored in fully automated high-stacking stores of impressive capacity. For high-purity fittings and valves, there are 2,500 storage bays and 100,000 m of Purad piping are always in stock. This extensive stocking of standard products and the high-efficiency global logistics network ensure outstanding delivery capability, the spokesman points out. According to him, one major challenge during construction was to make sure that plant traffic could be maintained unimpeded. And working to a tight schedule, the site crew also had to contend with subsoil conditions that required some 400 piles to be driven to stabilise the ground. As far as marketing this premium-grade piping system is concerned, however, alongside proven product quality, certified compliance with Austria’s high production standards is another big plus, says the spokesman. Furthermore, Agru backs up its products with the appropriate range of services. Along with the logistics network, applications-engineering support is another of Agru’s unique selling points. The company conducts an ongoing programme of training and certification of partner companies for professional installation of its products. Its supervisors with many years’ field experience are available on request, so during installation their hands-on advice and assistance are always on call. User-oriented welding training and rental and sale of welding machines are also included in the portfolio of services from the plastics experts. The company, which has an export quota of 95 per cent, has customers all over the world. This is the reason why Agru products have been issued 190 country-specific approvals for supply/disposal, storage and transportation of everything from hazardous substances to ultra-pure media.